Warwick Castle CastleImagine a totally electrifying, full day out at Britain’s ultimate castle. Where you can immerse yourself in a thousand years of jaw-dropping history – come rain or shine. Where ancient myths and spell-binding tales will set your imagination alight and your hair on end. Where princesses are pampered and maidens are wooed. Experience the heat of battle at such close quarters you’ll almost smell the fear, as winners become true heroes and losers are confined to dark, dank dungeons to be forgotten for eternity. Imagine a totally electrifying, full day out at Britain’s ultimate castle. Where you can immerse yourself in a thousand years of jaw-dropping history – come rain or shine. Where ancient myths and spell-binding tales will set your imagination alight and your hair on end. Where princesses are pampered and maidens are wooed. Experience the heat of battle at such close quarters you’ll almost smell the fear, as winners become true heroes and losers are confined to dark, dank dungeons to be forgotten for eternity. It could only be Warwick Castle. We are open daily from 10am (except Christmas Day). Closing time varies with the season. When are you thinking of visiting us? Last admission is always half an hour before closing time. Attraction and shows operating schedules are subject to change without warning. During poor weather conditions, the high towers and ramparts will be closed for safety reasons. Easy to get to by motorway, less than two miles from Junction 15 off the M40. 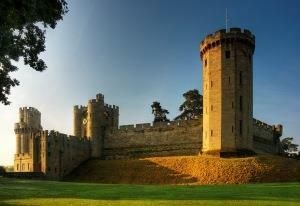 Take the A46 into Warwick and follow signposts for the castle. Nearest station is Warwick. Turn right out of the station onto the Coventry Road, at the junction turn right Smith Street. Proceed to Castle Lane and the Castle is on the left.